Bollywood actor Suhail Nayyar and supermodel Sonalika Sahay feature in our Eid special. Here’s the style saga we scripted for them. On the occasion of Eid, we present a style-studded love story that has all the inspo for you to glam up a sparkly Eid soirée. Zubair, (played by Suhail Nayyar), a Delhi trader, spotted the beautiful pet groomer Bilquis (Sonalika Sahay) dancing to Afghan Jalebi in his cousin’s wedding video. Without a single playback, the happy-go-lucky Zubair knew Bilquis was his girl. He had his cousin scan the guest list of 1,500 people to trace Bilquis’ address. The foreign bred Bilquis found Zubair ‘too mainstream’ for her liking. Flustered, he went on a pet buying spree to ensure a daily trip to Bilquis’ pet salon. We don’t know if the pets won her heart or it was Zubair — they were married in a month flat! And that’s when Bilquis discovered that each of Zubair’s pets were either rented, borrowed or kidnapped from his friends’ house! It’s been a month of togetherness and today, Zubair’s uncle has thrown a grand Eid feast that’ll have the attendance of who’s who of the Capital. 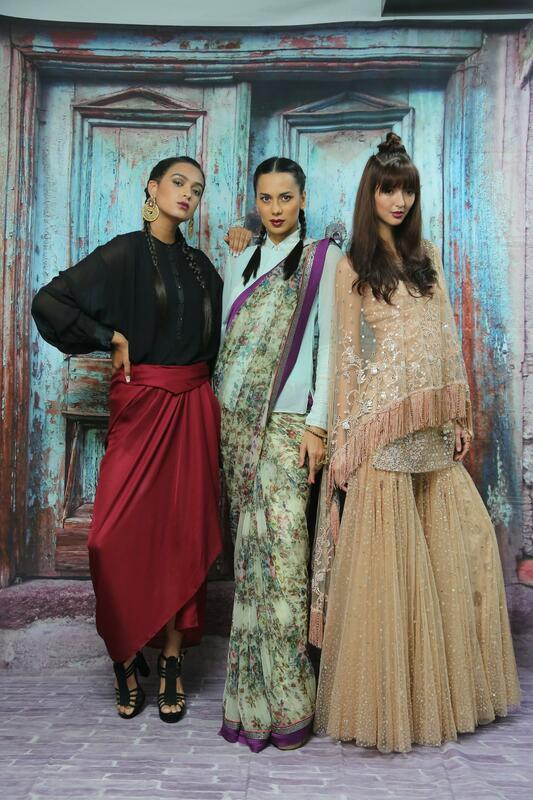 Bilquis, the style renegade wants to impress her husband with her take on fashion, so she won’t wear the predictable salwar kameez that her sister-in-laws are wearing to the party. Zubair too wants to look as chic as his wife so he won’t follow the beaten track. 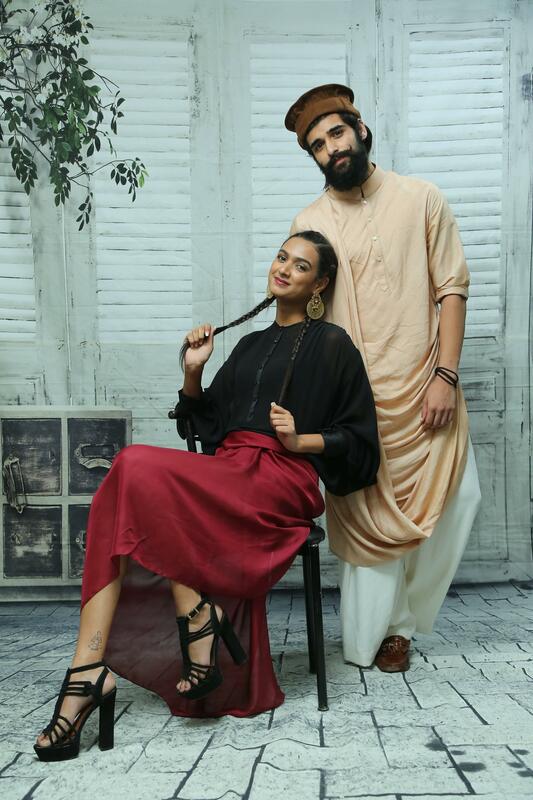 Here’s how the couple put their Eid look together. Zubair’s begum decides to make her Eid look more ‘Bilquis’, the vivacious person that she is. 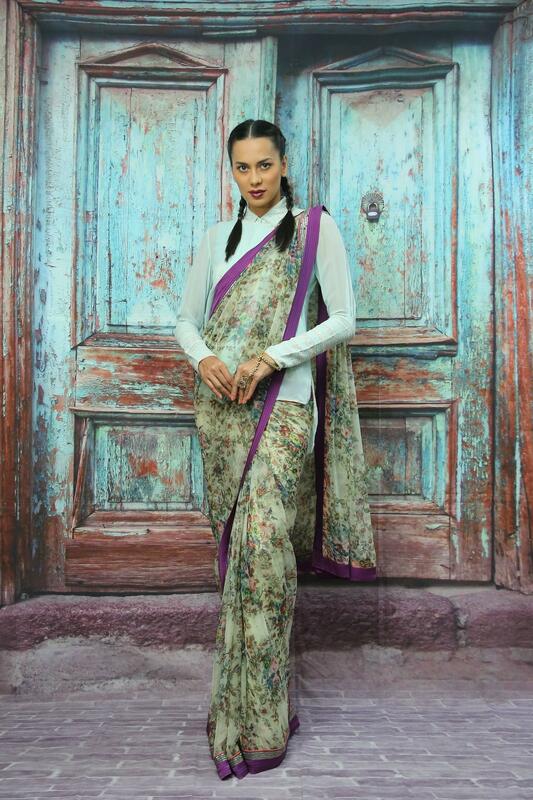 She pairs her printed Ritu Kumar sari with her powder blue Tarun Tahiliani shirt. She experiments with her hair – instead of her staple top bun, she goes for tomboy-cool boxer braids. A light base and a deep shade of oxblood for her lips complete her makeup. Zubair, be ready to get swept off your feet all over again. Zubair knows it’s tough to beat Bilquis in her style game. So he decides to go for something that Bilquis wouldn’t expect him to wear. 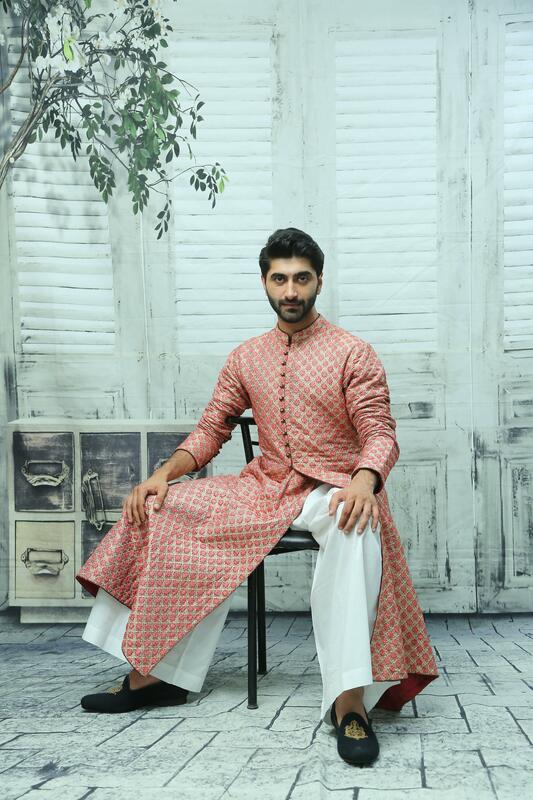 A pink brocade achkan from Kotwara by Meera and Muzaffar Ali is his pick for the evening, with his sleeves rolled up. He pairs it with flared pants and juttis. He breaks the fashion myth that pink is not the colour for men yet again with his pink reflective sunglasses. Someone will have to keep catching her breath for the rest of the evening! It’s going to be a starry gathering! Dressed in a blue kurta, a bandhgala and an off white churidaar from Raghavendra Rathore, Zubair’s friend Zorawar, a prince from Mewar steps into his convertible and drives through the boulevard only to see the doll-esque Zara, a Hollywood debutante standing in solitude. Exuding sensuality in a beige sharara with cape from Tarun Tahiliani, she wears her hair in a half-up top knot. As her car breaks down, she waits for a lift to the most happening Eid party in the town. She hops into his car, only to tell him that it is her last day in the city and she will be flying back to New York the next day. Zorawar is already smitten by her beauty and wants to tell Zara that he’d like to see her again. But he doesn’t know how to stop her. Will his regal charm work its magic on this modern, independent woman? Zorawar’s sister Zoon is all excited about the Eid celebration she is attending with her brother. Her choice for the soiree is something minimal yet trendy. She wears a black tunic top and sheer red slip ensemble by Tarun Tahiliani with strappy block heels. Shaamir, her college senior is also attending the Eid dinner, and they are meeting after almost a decade. He is hopeful to get all the attention with his vougish stubble and moustache and Pakol (the Afghan cap). He wears a peach cowl kurta and flared pants by Shantanu and Nikhil. In college, Shaamir and Zoon hardly spoke to each other and Shaamir could never tell her what he feels for her, but this evening can change the course of their lives forever.